The alleged “indie” movement, always primed to make “heartfelt gems” rather than masterpieces, now seems to be on its last legs. Odd to remember that Jim Jarmusch and Rick Linklater, its two most noteworthy originators, are unapologetically artistic types. Of the two, Linklater has always been the more unassuming. Not unlike one of his charming, intelligent, loquacious characters, he wears his artistry lightly. If Jarmusch is the poet of American bitterness, then Linklater is the poet of American freedom, his characters comfortably operating as solitary satellites or within supportive enclaves of artists and eccentrics, free from alienation and freely giving voice to their obsessions and impressions. Many people regard Linklater’s films as “small,” hip,” “mellow,” “pleasingly low-key” – lifestyle components, befitting the indie profile as it evolved into a marketing tool. It’s not an uncommon occurrence in film criticism to get the artist mixed up with his/her subjects – just as Scorsese is often confused with his De Niro/Pesci characters, Linklater will probably always be thought of as a charming slacker. In fact, he’s a supremely attentive artist, to small things like the mood in a coffee shop or a 7-11, or the precise way that time passes on a long train ride. On another level, he has an acute understanding of the endless searching that lies at the heart of every well-examined life. It’s easy to miss the undercurrent of tension in Linklater’s work, perhaps because it’s a form of tension that haunts us all at one time or another, consciously or unconsciously: whether to seize the moment, clarify it or just live it. 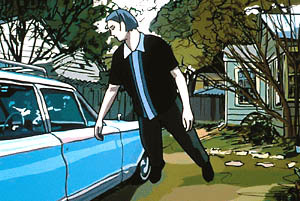 Waking Life (2001) might be the most remarkable thing Linklater’s ever done. The film is a flowering of dreamlike encounters contained within a series of dreams that become increasingly extended and disturbingly cryptic as the film goes on (just like a night of real REM sleep). They are dreamed by one of Linklater’s typically relaxed, quietly self-questioning heroes, played by Dazed and Confused‘s Wiley Wiggins. Part of the excitement of Waking Life is that it seems to be thinking itself through as it goes along – in other words, not merely a “smart” movie but a movie with a brain of its own. Sometimes it feels like the brain belongs to Wiggins, but his point of view keeps thinning out, expanding and dissolving into the events and landscapes he encounters. Thus the scary question at the heart of Waking Life: in the end, how important is the distinction between our perception and the world we perceive? There’s a novel aspect to Waking Life which will doubtlessly overshadow its complexity and subtlety. The film was shot on DV, cut, and then animated by thirty different artists (including Wiggins) under the supervision of Bob Sabiston, who designed the proprietary software animation program used on the project. The look of Waking Life has been likened to rotoscoping, but it feels more solid, less amorphous, and yet it moves with greater fluidity. Every shape has real beauty and presence, and the images are often 3-dimensional, with objects on multiple planes gently floating and swaying against one another. The movie opens with a young boy pondering the message “Dream is destiny” written in a girl’s cootie catcher (she’s played by Linklater’s daughter Lorelei). Later, he gazes up at a shooting star, his enormous eyes hovering away from his small face, then wanders over to a car and holds fast to the door handle as he closes his eyes and dreamily floats off his feet. He wakes up as a young man, sitting on a train with his head propped against the window (a signature Linklater image). From there, we move through a string of visions and encounters that includes a chamber group rehearsing the stark, properly dizzying tango score for the film itself; a scientist breathlessly elaborating a new paradigm shift in human evolution; a man trumpeting a metaphysical wake-up call over a loudspeaker as he cruises the streets of Austin; a monkey showing a film collage to a packed basement lecture hall; a man in a bar telling a story about the time he shot someone who tried to hold him up (if the story sounds familiar, that’s because it’s been told before in another movie: the man is Steve Prince, the subject of Scorsese’s ferocious 1977 documentary American Boy (where he told the story the first time) and gun dealer in Taxi Driver. Each new scene is animated by a different artist, and while the world feels different from moment to moment (and style to style), it also remains eerily the same. Linklater articulates something very delicate here – the way that life seems to keep turning over another page, forever promising that it’s bringing us one step closer to ultimate reality. As all these ideas, inspirations and pronouncements segue into one another, each one of them reckoned definitive by the person voicing them, Wiggins keeps trying to wake up (often to dismembered, floating digital numbers on his clock). A subtle form of anxiety starts to build – how much can one consciousness handle? Like previous Linklater movies (Slacker , the Proustian Dazed and Confused , Before Sunrise , even the lovably wayward The Newton Boys , the only one of the director’s films without a time-sensitive structure), Waking Life walks a deceptively simple path. On the surface, it may feel hopelessly collegiate and even repetitive, a gaggle of eccentrics with big theories about the nature of existence blended with sociopathic malcontents and inner-journeying slackers. But it’s the resounding certainty behind the statements more than their actual content that counts, the poignancy of so much searching, of banking on this or that theory or notion or idea that promises to Explain It All. Meanwhile, time keeps flowing on, and Wiggins keeps waking up to another dream. As Waking Life moves into its final section, it becomes less playful, more troubling and mysterious: the nature of time seems to be urgently imparting itself, through dreaming, to this befuddled young man. When Wiggins follows a suggestion from a character played by Linklater himself to “just…wake up,” the numbers on the clock are still discombobulated. He winds up back at the house where he began, and the presence of the material world itself suddenly becomes moving – the house seems ineffably sad, like the early-20th century houses that Linda Manz sneaks past in the final moments of Days of Heaven, a movie by another phenomenologically-minded Texan. Just as he did with the slow track down an endless road that closed Dazed and Confused, the declaration of faith at the end of Before Sunrise or Slacker‘s final images suspended between chaos and order, Linklater ends Waking Life with an image perfectly pitched between transcendence and terror. It’s a film that might leave you giddy with its multiplicity of viewpoints, its beautiful freedom. What touches me most about Waking Life, and about Linklater’s work in general, is its devotion to a particular strain of American experience – the act of talking one’s way to nirvana. We’re a nation of statement-makers and opinion-holders, but unlike our European cousins we tend to speak in a voice that carries the ring of hesitation, doubt, humility in the face of the divine. Linklater has a feel for that voice, which runs back to Hawthorne and the Metaphysical Club, and encompasses everyone from mystics to sociopaths. He sets it against just the right backdrop of plain-old ordinary everyday-ness, in just the right relaxed key. If Tarkovsky had been born in the heartland and raised on Superman and fundamentalism rather than Pasternak and the Orthodox church, he would have made a movie exactly like Waking Life.